Have you just registered your new shiny domain at Siteground? Or perhaps you’ve transferred your domain to Siteground. 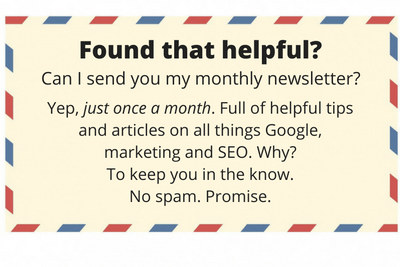 Now you’re looking for a domain-based email address, right? Maybe you’re looking for a few email addresses linked to your domain name. 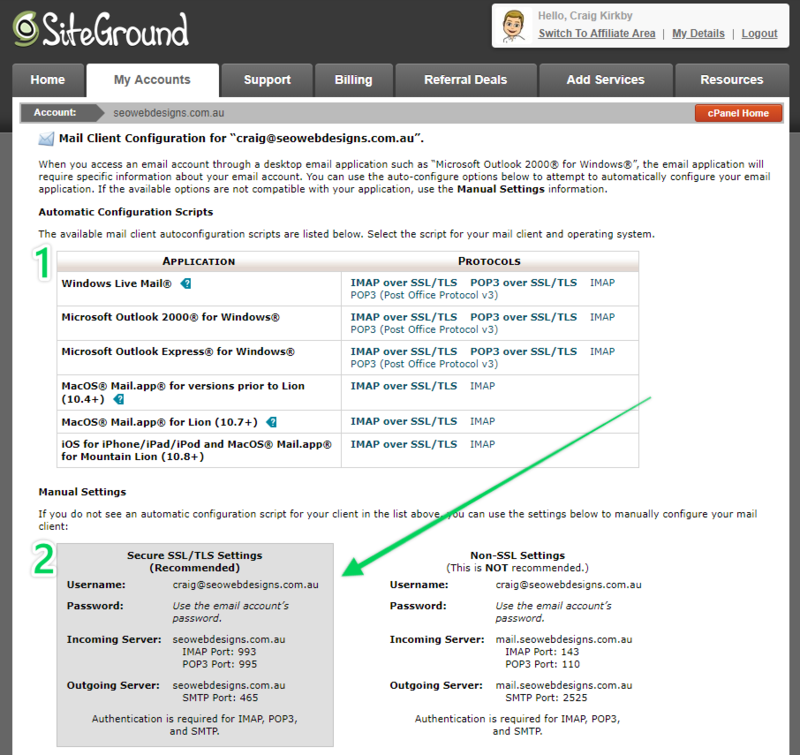 This tutorial walks you through how to create an email address at Siteground in six easy steps. This tutorial is best viewed on a desktop or tablet. 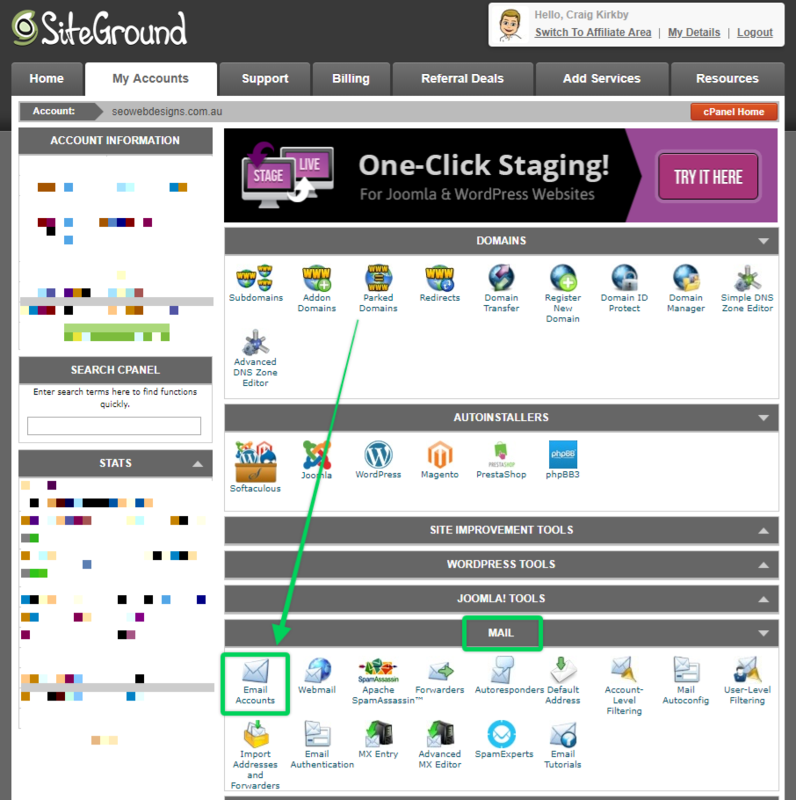 Log in to your Siteground Dashboard. Under the Accounts tab, select the red “Go to cPanel” button. If you get a pop-up asking you to proceed via secure access, simply click the green “Proceed” button. In your Siteground cPanel (aka Control Panel), scroll down to the Mail tab, and select “Email Accounts”. Create your email address by choosing an email prefix (1), such as your name or something like info, and choose and confirm a strong password (2). 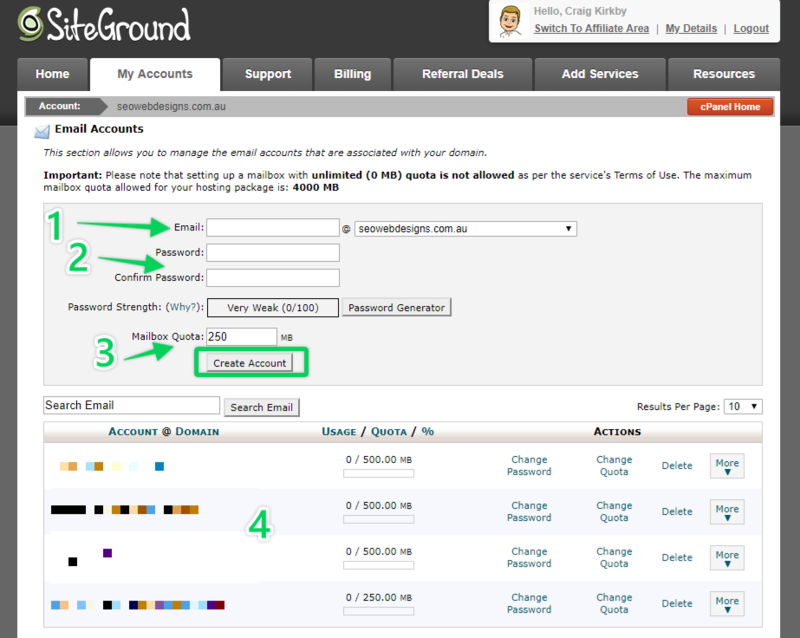 Select your Mailbox Quota (3) before pressing the “Create Account” button. Once you’ve done so, your new email address will appear in the list below (4). Your domain name will appear automatically as the suffix of the email address. 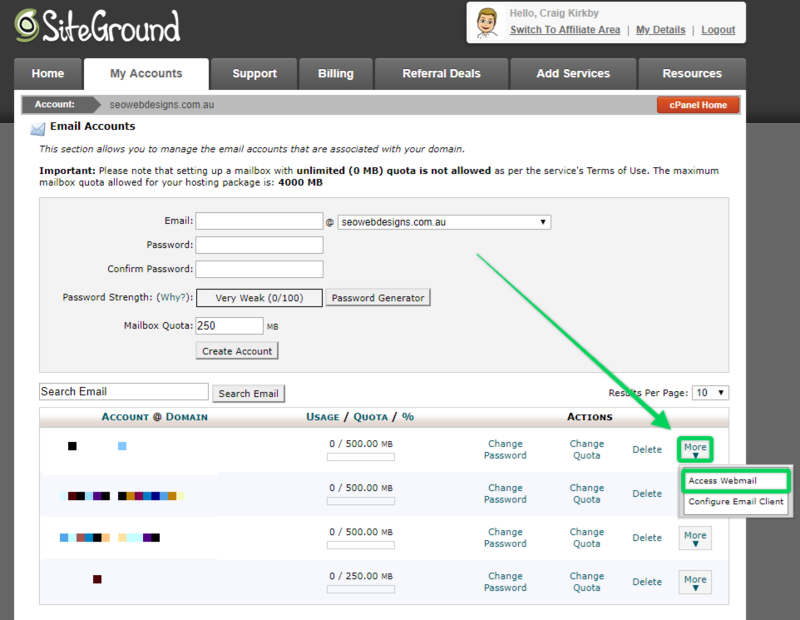 If you have several domains registered at Siteground, you can choose the appropriate one via the drop-down link. For a primary email address, I suggest a Mailbox Quota of 500MB. For any secondary email addresses, I suggest the default 250MB. You can have any number of email addresses depending on how much Mailbox Quota you allocate to them versus the limit of your hosting package. In the above case, you can see the limit is 4000MB. To configure your email address to your choice of Mail Client (eg. Gmail, or MacMail or Outlook, etc. 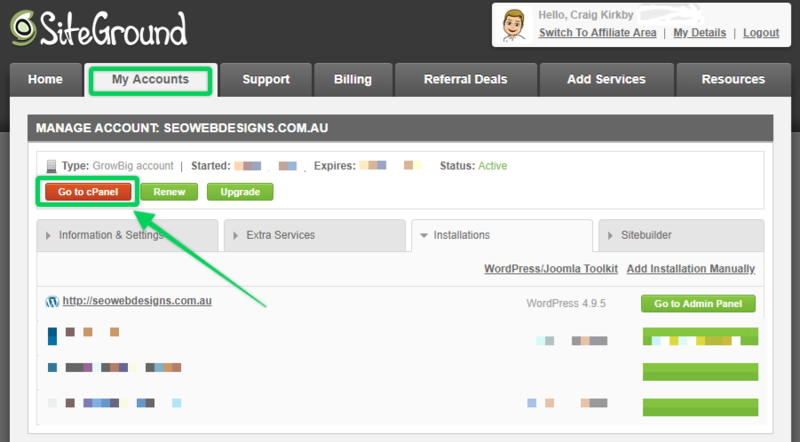 ), toggle the little “More” button next to your new email account and select the “Configure Email Client” button. You can access your mail via the “Access Webmail” link instead of using a more popular Mail Client. However, you’ll find the mailboxes woefully inadequate. They serve only to retrieve emails until you’ve configured a better option. On the Configuration page, you’ll now have two options. You can either use an automatic script (1) if your Mail Client of choice is listed, or you’ll need to manually configure your mail (2) if, for example, you want to use Gmail. For auto-configuration scripts, select the script that matches your preferred Mail Client and your operating system. Then follow the prompts. For manual configuration (which I recommend), use the Secure SSL/TLS Settings. → Use the information exactly as indicated. → The password is the one you selected in Step 3 above. → I recommend using POP3 and not IMAP. Why? IMAP stores your mail on both your Mail Client and on Siteground’s server. This means you’ll have to login to your stored mail on the server and clean it up to prevent exceeding storage limits. No one remembers to do this until emails start bouncing. By the time you remember how to access the mail on the server, you’ve irritated clients and lost emails. POP3 does not store mail on the server and therefore you’l never exceed your limits. Your Mail Client of choice will determine where you add the information at Step 5, and therefore it’s beyond the scope of this tutorial. 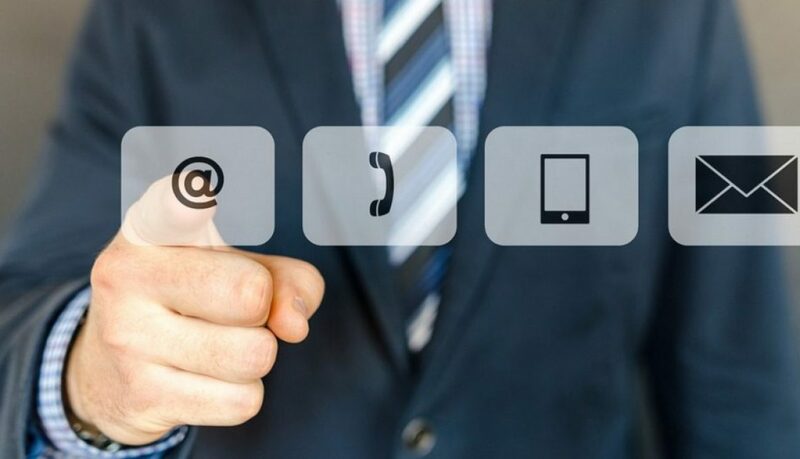 However, what you’ll still need to do is retrieve a verification code from Siteground’s server to verify the hook up to your Mail Client of choice. So, to be clear, during the process of adding the information at Step 5 in your Mail Client, you’ll be asked for a verification code. Click the back button in your browser (or the little “Go Back” button on the Configuration page). 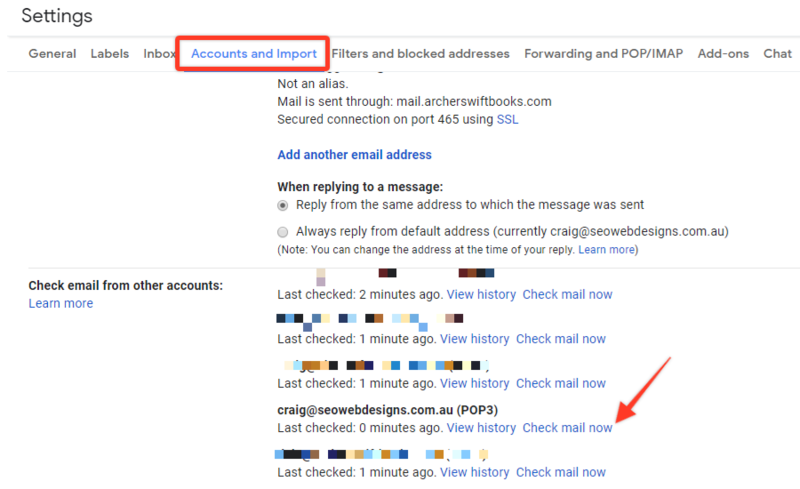 Toggle the “More” button and select “Access Webmail”. You’ll be redirected to a new page offering your three mailbox options. Click anyone of them to retrieve the verification code you need. Click on “Horde”, or any of the other two if you prefer, and you’ll be redirected to a mailbox. Your verification code will appear in the inbox. Use your verification code to complete the verification process and you’re all good to go. 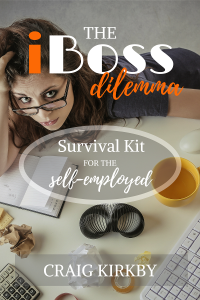 Because there can be up to an hour delay between Siteground’s server and Gmail (i.e. between when Siteground receives your email until it’s delivered to Gmail), you may want to take note of this quick tip on refreshing your emails. 1.) 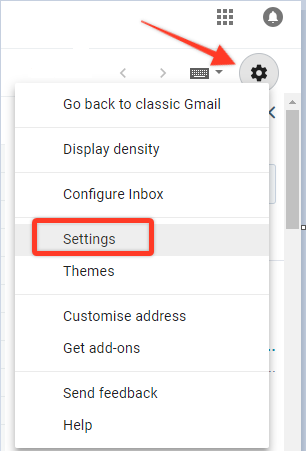 Click on the Gear icon in the top right-hand corner of Gmail and select “Settings”. 2.) Select the “Accounts and Import” tab, scroll down to “Check email from other accounts” and click “Check mail now” against any email addresses you want to refresh. 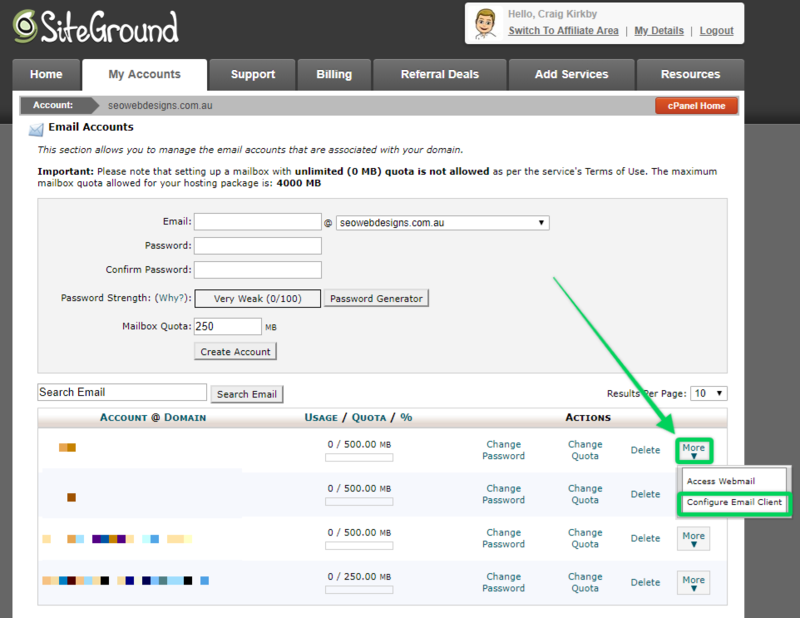 This will flush the mail from Siteground immediately and deliver your current emails to your Gmail mailbox.